The "Aaron's Party" singer is officially making his comeback. 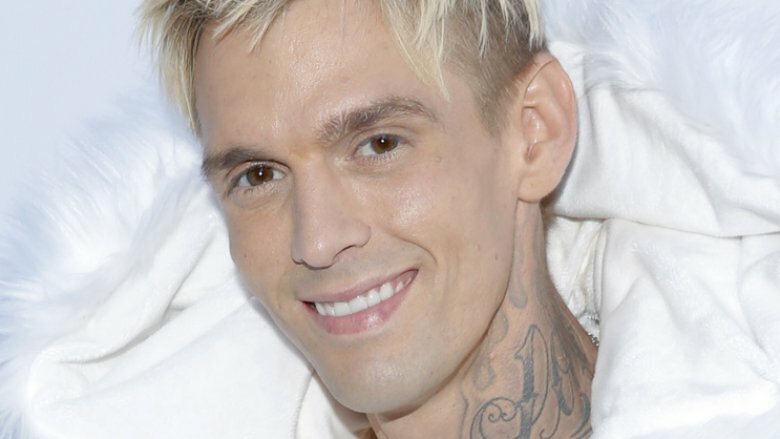 On Tuesday, Jan. 30, 2018, Aaron Carter announced that his upcoming album, LøVë, will be released on Feb. 16. It is his first LP since 2002's Another Earthquake. "For me, it's all about the music. And if there is one lesson I've learned this [last] year, it's to not dwell on the past, but to live for the future," he said in a statement (via Entertainment Tonight). "I am so grateful to my fans and look forward to sharing this deeply personal music which came from the inner core of my heart and soul." The 30-year-old singer also revealed that he'll be hitting the road soon after the record drops. According to his website, his 2018 tour will kick off on Feb. 22 in Teaneck, N.J. and end on March 16 in Kansasville, Wis.
As Nicki Swift previously reported, Carter gave fans a taste of his new sound in December 2017 with the release of his lead single, "Don't Say Goodbye." "I'm excited about my new release #dontsaygoodbye without all the negative bulls**t, it feels good to be in the place that I am today," he tweeted at the time, adding, "Thank u to everyone who supports me and my music and actually listens I have a message it's love hard love love that I can't live without." Carter managed to find his way back into the spotlight during a rather difficult 2017. The "Sooner or Later" singer was arrested for an alleged DUI and marijuana possession in July, only months after his father passed away. Since then, he publicly feuded with Backstreet Boy brother Nick, broke up with his girlfriend after coming out as bisexual, totaled his car in a severe accident, and was visited by police at home following an alleged suicide threat. Thankfully, Carter seems to be in a much better and healthier place these days as he looks ahead in 2018. He debuted his jaw-dropping transformation in November, having gaining 45 lbs. since entering rehab in September, following an emotional appearance on The Doctors.